The best way to clean laminate floors is by sweeping daily and vacuuming and mopping weekly. While laminate flooring is less expensive and more durable than real wood flooring, it does require maintenance to retain its beauty. Unless the floor manufacturer provides different cleaning instructions, you should not use dish soap or a commercial cleaner on laminate flooring. Soaps and harsh detergents will dull the finish and may damage the protective top layer. By sweeping the floors daily, you’ll prevent fine scratches from marring the surface and you’ll ensure that dirt and dust won’t be tracked to different areas of the house. The best way to clean laminate floors then, is to establish a routine and stick to it. To avoid scratches, sweep or dust laminate floors daily. To avoid damage between the planks, vacuum between them weekly. To remove dirt, wash the floor weekly with a damp mop. Make sure the mop is damp, not wet. Water will damage laminate flooring by warping the underlying fiberboard. Once this happens, the planks will spread and will need to be replaced. After the floor has been washed with the damp mop, make sure to dry it thoroughly with a cloth. Both brand name and store brand dry dust cloths work well. Make sure to remove any water that has accumulated in corners, between planks and under counters. The key is to remove all moisture from the floor. 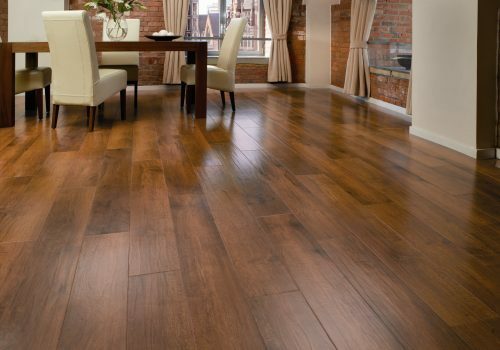 Unlike linoleum or tile floors, laminate floors cannot be left to air dry. Kitchen floors in particular might require more than just water to clean. To sanitize your floors, you can use a mixture that is one-part water to one quarter vinegar. If you have a large floor, you may want to mix one quart of water with an eighth of a cup of distilled white vinegar. Pour the mixture into a spray bottle and lightly spray a small area of the floor. Only spray the area you can mop within a few strokes. Don’t spray the entire floor, as you don’t want water to sit on it any longer than necessary. Be sure to dry the floor thoroughly as outlined above after using the vinegar and water mixture. The best advice for cleaning up spills is to wipe them up immediately after they happen. Even small items such as chopped lettuce, bits of chicken and squash seeds will stick to the floor once they become dehydrated. To clean stuck-on food from laminate floors, use the vinegar and water mixture. Spray a small amount on the food to re-hydrate it and let it sit for a minute or two. Using a soft cloth, rubber spatula or other utensil that won’t damage the floor, gently scrape the food to remove it. If you need to, add a little bit more of the vinegar and water mixture and repeat until the food is completely removed.